This page lists some of the software you can get that displays a 24 hour analog clock. Some can be downloaded from this site; others are links to free, shareware, or commercial sites. If you know any more, please let me know – or write one! A few more Windows examples would be good to have. Here’s a neat 24 hour clock for phones running Android, from Steve at staticfree.info. You can read about it here. Max Emerson’s Yahoo widget can be downloaded from Softpedia. It says Windows, but it’s probably Mac as well. If you’re using Apple MacOS X Leopard, by the way, you can easily make any web page (or any item from a web page) into a new Dashboard Widget. Visit the web site in Safari, then choose File>Open in Dashboard. Follow the instructions… ! This iPhone app is called Sol, written by Alexander Valys (web site sol.avalys.net. It’s an elegant sun clock showing the rising and setting times of the sun for a number of locations, ona 24 hour dial (12 noon at the top, 24:00 at the bottom). Chris Wiegman‘s LifeClock lite is for iPhone. Watchmaker for Palm has an interesting 24 hour option with abbreviated city names around the edge. A Flash clock was kindly sent to me by Juan Carlos Tejedor, from Zaragoza (Spain), who says that he first saw a 24 hour analog clock in an episode of ER on TV. He modified an example supplied by Macromedia. This web page has been designed specifically to work on an iPhone or iPod Touch as a web application . In fact, I suspect that it won’t work in any other browser apart from Safari. The artwork is mostly in PDF, for one thing. If you have an iPhone please try this out, and let me know what you think! Note that a single tap will rotate the dial so that 12 or 24 is at the top. The red hand is supposed to show GMT. This screensaver is a version of a fascinating watch designed in the early 1970s by engineer and designer Tian Harlan. I’ve made a 24 hour version as a screensaver for MacOS X, using Quartz Composer. On a Chromachron device, the time is indicated by the color and angle of a slit in a rotating disc. Beneath the disc the circle is divided into 24 sections (in the original 12 hour version, the disk was divided into 12 sections). Time is indicated both by the color of a slit in a revolving disk, and by the angle of the slit (similar to the hour hand of a conventional clock). The disc revolves at the speed of one coloured segment per hour, so that it is not possible to read the exact time: five minutes before twelve is read as “a short time before yellow”. This approximate time measurement system was described as ‘ending the dictatorship of the exact time’. In total, Harlan designed approximately one hundred different watches. His work has been exhibited in Berlin, London, Amsterdam and Paris. It’s said that his Colour-Time watches were worn by, amongst others, Ringo Star, Max Bill, Charles Aznavour, and Carlo Levi. Update: Craig Lawson added some more features to my first version. The download link below now downloads his version. Thanks Craig! Unfortunately his web site appears to have closed, but you can probably still find this available for download somewhere. In 1852 Charles Shepherd installed a new clock outside the gate of the Royal Observatory at Greenwich. This was an electrically operated clock, one of the earliest ever made, and it was controlled by a master clock mechanism inside the main building. This screensaver is a reasonably accurate simulation of the famous Shepherd clock. If you’re running MacOS X Tiger, take a look at this neat Dashboard widget. Antony Pranata wrote an excellent Java clock, which I’ve modified to show the time using the 24 hour system. You can see the clock in action at André’s site, which is the definitive guide to 24 hour watches. One of the whizzy new features available in the latest MacOS release (10.4) is the Quartz Composer, a graphical programing environment for creating animated visuals. Quartz composer is free with every copy of the OS. I’m neither a programmer or an artist, but I’ve managed to copy and paste a few bits of code to produce this 24 hour analog clock screen saver. Expect the usual swooping rotating text and churning cycling gradients. I’ve modified Apple’s World Clock Dashboard widget to provide 24 hour analog time. I’m still learning about Dashboard, and how to make the graphics, so consider this a work in progress. TimeDisc is a clever, ingenious, and elegant clock that uses coloured sectors. The clock can float over other windows, and can be transparent too. It also can appear in the Dock and in the menu bar. Andreas Mayer, the author, has added a 24 hour option. 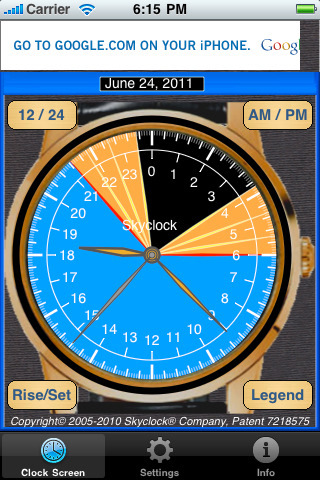 This is a simple 24 hour analog clock application, based on Apple’s Clockview source code. This is a very basic application, with hardly any features, and no professional polish other than what Apple supplied. I haven’t a clue how to add new features – it was easy however to make the necessary maths adjustments to convert the 12-hour analog clock code to 24 hour operation. iPulse is a fabulous system monitoring tool/widget/gadget, which shows about 250 system parameters using a combination of dials, gauges, and floating windows. The developers saw the wisdom of providing a 24 hour clock mode (there’s a 12 hour clock mode too, for backwards compatibility). Visit the IconFactory to find out about iPulse. The Electric Astrolabe is a fully animated planetarium program in the form of a planispheric astrolabe. The singular advantage of the astrolabe display, it claims on the web site, is that it shows the entire sky, both visible and invisible, on a single screen. Unlike a static instrument, The Electric Astrolabe can be set for any location and includes accurate positions of the Sun, Moon, and planets. In addition, The Electric Astrolabe includes over 150 stars which can be displayed as constellation asterisms and all of the Messier objects. Either a north or south projection can be shown. You can also display the phase of the Moon, Jupiter’s moons, Saturn’s rings, lunar eclipses and the phases of the planets at any time. The color of the sky above the horizon changes from blue, through twilight gray to black depending on the position of the Sun. Also included are an animated orrery showing the planetary orbits and several text screens giving precise solar, lunar and planetary positions, a help screen and several screens for customizing the program to your location and choice of colors and making it easy to use. This is a 24 hour analog clock for your PalmOS handheld computer. This is a demonstration of the power of the DragonForth development environment. The original clock code was written by Dmitry Yakimov, at http://www.delosoft.com. I’ve adapted it for 24 hour analog operation. It used to work with PalmOS 3.5. I don’t know whether it works on more recent systems. This application is a free clock-construction kit, with the ability to define 12 and 24 hour analog and digital clocks. You can play with it for hours! The clocks you build run natively in OS X in floating, transparent windows, although the editor is a Classic-only application. Here’s a screen shot of two of my first attempts. Both are noon at the top designs. The smaller one is a conventional hand-based style, the lower one is a playful investigation into a different style using dots instead of hands: the red dot shows the seconds, the green dot the minutes, and the yellow ‘sun’ dot the hour. Both clocks are translucent. Visit the Zenmai clock site. This is a simple 24 hour analog clock, with a nice sweep second hand. There are various keyboard shortcuts for zooming in, out, and panning. The clock can lose the current time if your computer sleeps. This is probably because it’s just a demo of SVG, rather than a proper clock. Bernd has written a free alarm clock program to try out the FLTK toolkit for making GUIs and things like that. It has a 24 hour analog option. Hello! I’ve recently had the idea to tweak the standard Windows 7 clock gadget and turn it into a 24 hour clock. modify the gadget’s info that appears when clocking on “show details” in the gadget selection window. First of all, go to “C:\Program Files\Windows Sidebar\Gadgets” and copy the “Clock.Gadget”. Then press the windows button +r keyboard shortcut to open the “run” command window, and type in “shell:gadgets”. This will take you to the location on your computer where third party gadgets are stored. I’m pretty sure you could leave the edited gadget in the original location also, if you prefer. Paste the “Clock.Gadget” folder here. I’ve renamed it “Clock24.Gadget” to avoid confusion, and that’s how I’m going to refer to it here too. NOTE: when renaming this folder it is imperative to keep the “.Gadget” part of the name as is, only change the first part of the name. and that’s that, save and exit. Return to the main folder of the gadget and go to the “images” folder. As you can see, this is where all the clock faces and hands are for the different clock skins. You can modify the images for any of the skins, and when you choose that particular skin for the clock it will show your new images instead. I chose to edit the “traditional” clock face. This is at the end of the folder, and contains the files “trad.png”, “traddot.png”, “tradh.png” and “trad_m.png”. Now you will either need to find or edit an image with a 24 hour clock face so that it’s 130 x 130 pixels. You can even draw it yourself if you’d like. Let’s say, for example, that you borrow a clock face from the “world time server” gadget, which is shown on this site in the “software” article. Just download the world time server gadget and install it, go to the folder for the third party apps as explained above, and choose a face from the “images”. These are all already 130×130 pixels. Once you’ve found or made an image, copy it into our gadget’s “images” folder, delete the “trad.png” image and rename your image to “trad.png”. Now, if you open the gadget selection window (meaning right click on the desktop and choose “gadgets”) you should see two gadgets that look like the original windows clock gadget. One of them is our gadget, drag both to the desktop to find out which one is ours and see that it is working properly (i.e. it is pointing at the right hour and the background image is showing as intended. You can now edit the hour and minute hands as you wish, simply repeat the procedure that we did for the “trad.png” image to change the “tradm” and “tradh” files to whatever you like. To avoid confusion when selecting the gadget in the gadget selectin window, let’s change its icon. In the main folder of our gadget, you will see two files “drag.png” and “icon.png”. The icon.png file is what is displayed in the gadget selection window, the drag.png is what is displayed beneath your mouse as you drag-and-drop the gadget on your desktop. I chose to simply copy the new clock face image for the “drag.png” file, and then resize a copy of the file to 71×71 pixels for the “icon.png” file. Furthermore, in the gadget selection window, if you select your gadget and choose “show details” on the bottom of the window, you will see a bunch of info which you can edit, I chose to ignore it as I never look at it anyway. What I did do was delete the “logo.png” file in the main folder of our gadget, as I didn’t need it.if you wish do edit any part of the info, just go to the “en-US” folder and open “gadget.xml” in notepad.basically what you need to do here is identify where in the code you can find the text displayed as info that you wish to remove or change, and then change it. For example, you can find the text “Watch the clock in your own time zone or any city in the world.” between the “” bits and simply change it to “This is my first incredible amazing 24 hour clock”. I highly advise you to create a backup of this “gadget.xml” file before experimenting with it, as the gadget may give you errors if edited improperly. the hands are edited versions of the “modernm” and “modernh” files in our gadget’s “images” folder. If only there were a nice analogue 24 hour watch/clock (with noon at top) for Windows mobile. Great site and nice interest! I’m about to learn my son the clock but it seems that it’s impossible to find a clock which shows 24 hours on 12 ticks, i.e. when the time is e.g. 2 the clock should also show 14 (and 10min.). I know, just a matter of background styling but nevertheless hard to find. In order to show how time passes it would be great being able to turn the dials dynamically on an iPod apps. instead of going into settings. I think there’s lots of things that you can do with such a simple thing as a clock face, especially for kids.It would be nice if the true analog 24 hour dial could be the first one that kids learn – logical and practical. But the real world is all around us, and it must be confusing enough already! Looking for a 24 hour analog app for Android [Eclair] based platform, on Samsung Galaxy. Will send you the file for this page to share the love! So sometime today I will post it. wouldn’t it be awesome to have a smart watch with 24 hours where you can also place labels on the times of interest. Can you please inform if it is already have it in ‘smart watches’? In what models? Analog Clock 24-7 is an extremely configurable 12/24 hour clock. In 24 hour mode you can have 12 or 24 at the top and choose 0 or 24 as the starting point. It can save multiple custom configurations and works as a widget or as live wallpaper. It’s the 24 hour analog clock for Android I’ve been waiting for.